They know spicy! New Orleans Creole Cafe in San Diego's Old Town. Who would have thought that San Diego would be home to the largest Mardi Gras celebration West of the Mississippi? But, it’s true, the Mardi Gras in the Gaslamp festivities draw thousands to downtown’s historic Gaslamp Quarter each year to let the good times roll. Maybe it should’t be such a surprise. Both historic waterfront cities boast strong Catholic heritage and unique cultural influences that spice up our language and cuisine. In fact, speaking of food, in San Diego you don’t even have to wait until Fat Tuesday to satisfy your cravings for N’awlins style cajun and creole flavors. A New Orleans Native, chef Bud Deslatte has been spreading the gospel of the cuisine of his hometown for more than 30 years in cities across the country. At Bud’s Louisiana Cafe in Kearny Mesa, he’s known for a menu bursting with authentic classics like the perfectly fried catfish plate which boasts a light, crispy cornmeal batter and the crawfish etouffee featuring a generous serving of crawfish tail meat pan sauteed with garlic, butter, thyme, and basil and tossed in a sauce of onions, celery, green peppers, and a light tomato roux. Pair it with an oyster shooter and you’ll be feeling like king or queen of your own, personal krewe. Nestled in the historic Old Town neighborhood, the New Orleans Creole Cafe is helmed another native of New Orleans with family dating back to the 1750s in Opelousas, just north of Lafayette. He’s teamed up with a native Southern Californian to create this intimate, charming eatery where the menu is based on authentic Creole recipes handed down through seven generations. Favorites include a spicy jambalaya and hearty po’boys stuffed with everything from alligator sausage to golden fried shrimp. Perfect with an ice cold Abita beer! Hillcrest’s Gulf Coast Grill mixes it up by incorporating flavors from the south of the border and elsewhere along the Gulf of Mexico. So, with your hushpuppies gumbo, fried catfish and blackened prawns you’ll also find a vegetable quesadilla with cilantro lime crema, pork chops with a spicy mango glaze and crab cakes paired with cajun rice and a black bean and corn salsa. Toast to this fiery flavor combo with icy, refreshing cocktail. Rum or tequila, your choice. Bon appetit and laissez les bons temps rouler! It’s possible that Jimmy Bufffet had some other beachside escape in mind when he penned his most famous song but, I’d bet you’ll agree the inescapable summertime anthem is perfectly captured in frosty, refreshing tequila treats on menus at restaurants throughout the city. In fact, with our close connection to Mexico and year-round margarita-ready weather, you might just find your lost shaker of salt in San Diego. 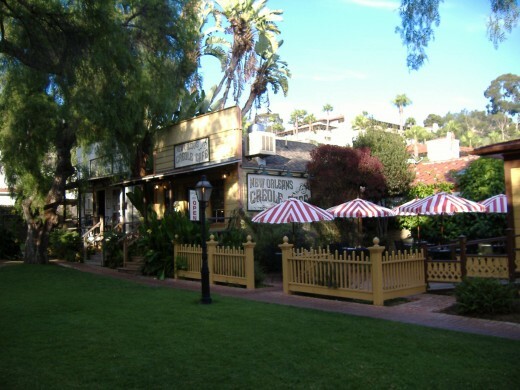 Start the search in Old Town, San Diego’s historic neighborhood that calls to mind bygone days when the region was actually part of Mexico. At Cafe Coyote margarita options number in the dozens with flavors ranging from the classic lime to prickly pear, pomegranate and pineapple chipotle. Want to learn more about tequila, the spirt that makes margaritas tick? Then drop by on Thursday or Friday evenings when Cafe Coyote’s resident Tequila Ambassador is on hand to answer all your agave questions. Head up the street to El Agave where you’ll find San Diego’s largest collection of tequilas numbering at more than 2,000 different varieties. This tequila museum includes many fine varieties that are suitable for sipping but they also make a mean margarita. Try one with their house blend tequila for an authentically San Diego ‘rita. Downtown, check out El Vitral where there are over 250 types of tequila behind the bar. 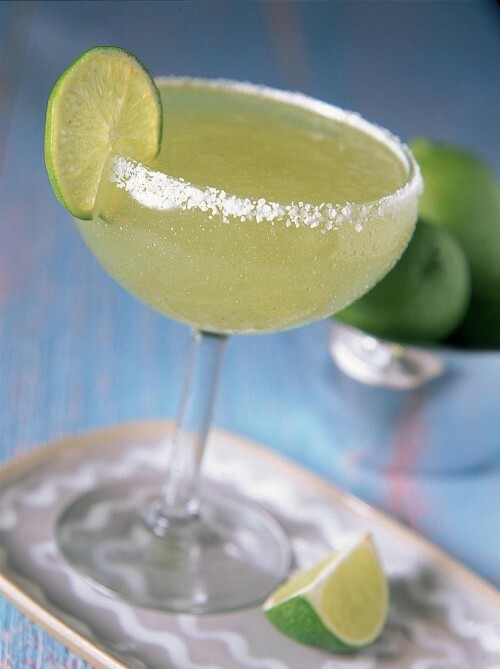 Order a margarita with a modern twist and spicy syrups flavored with chipotle or black pepper. Or, splurge on the $300 El Chilango which features ultra-high end spirits like Clase Azul Ultra, Grand Marnier 150, Del Maguey tobola mezcal and palo cortado viejo sherry blended with fresh lime juice. Scope out the Little Italy and South Park locations of El Camino Super Cocina where the Day of the Dead-inspired decor and kicky cowboy-boot shaped glasses are reminders that you don’t have to be so serious. After all, it’s a margarita and meant to be fun! Need a last minute gift idea for your beer-loving Valentine? Valentine’s Day, today, happens to be the release date for Stone’s 2011 Old Guardian Barley Wine an über malty, super-hoppy mega beer that clocks in at 12% AVB. If your sweetie is the type to cellar age their beer then you’ll want to pick up at least two bottles because this one will continue to evolve with age. Lost Abbey’s barrel-aged beers are works of art worth collecting in their own right. Pick up a bottle of the brand new 2011 Red Poppy that was just released on Feb. 12. The sour cherry tinged Flanders-style red ale is 5% AVB and has been aged for a full year in French oak barrels. It was one of only a few beers to be rated 99 out of 100 by the expert tasters at DRAFT Magazine. In honor of the holiday, AleSmith has released a special seasonal brew they’re calling My Bloody Valentine. At 6.66% ABV (alcohol by volume), it is less intimidating than it sounds with a deep mahogany red color and caramel malt flavor delicately balanced by floral American hops. Pick up a growler at the brewery or take your sweetheart into the tasting room and toast to your love of great San Diego beer. Want to make your Valentine's heart skip a beat? Nothing says Valentine’s Day like a box of chocolates. But, despite your best intentions, a box of mass-produced Russell Stovers from the drug store says all the wrong things. Instead, let me play Cupid. I’ve got a few sweet arrows in my quiver that are sure-fire hits. Want a gift that’s as beautiful and unique as your special someone? Set the mood with artisanal chocolates hand-crafted right here in San Diego. Chuao Chocolatier, with three locations in La Jolla, Del Mar and Encinitas, is offering up bonbons infused with aphrodisiac ingredients like honey, wine, chilies, strawberries and spices. The Elegancia box holds 32 of these decadent treats for around $50. 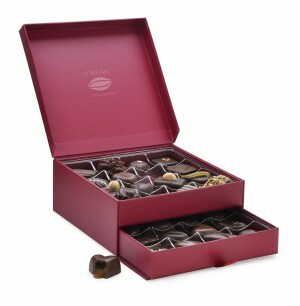 Or, go traditional with the Sweetheart – yes, it’s a heart shaped box – filled with 22 of the upscale candies in flavors like Firecracker, Passion, and Fragolina (a port-drenched dried strawberry enrobed in dark chocolate ganache) for $49. The team at North Park’s Eclipse Chocolat are already busy making a few thousand pounds of chocolate in anticipation of the big holiday. 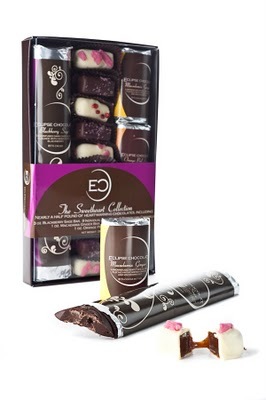 Try the Sweet Heart Collection which includes heart-warming chocolate bars in flavors like blackberry-sage, macadamia-ginger, chile-hazelnut and orange peel-anise plus creme fraiche caramels topped with pink peppercorn, merlot-infused sea salt, or candied rose petals. Priced at $30 and weighing in at over a half pound, it’s sure to hit the sweet spot. If candy isn’t your thing, what about cupcakes for your cutie? The hottest new kid on the block is the La Jolla location of the famous cupcake bakery, Sprinkles. It opened January 13 and there’s still a line around the block! Of course, you know that someone really loves you when they give you a scrumptious show stopper from Extraordinary Desserts. Karen Krasne’s beautifully crafted dessert masterpieces are almost too pretty to eat but, don’t let that deter you because they taste even better than they look. All are priced between $8.95 and $14.95 per slice. 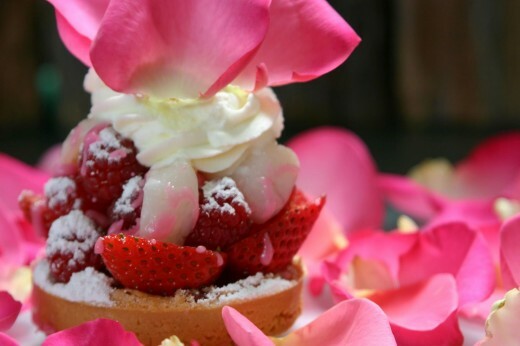 Pick them up or bring your sweetie in for a romantic dessert date to remember. Chocolates, cupcakes and dessert decadence. A little sugar that’s guaranteed to make your Valentine swoon. What’s your favorite sweet treat in San Diego? 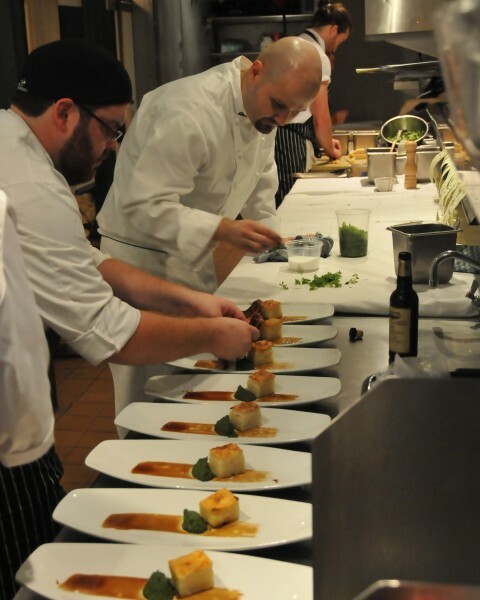 Chef Dan Moody, the mastermind behind Relate pop up restaurant, at work behind the scenes. Pop up restaurants are here today and gone tomorrow. That’s because these eateries are designed for a limited run that allows chefs to flex their creative muscles and push the culinary envelope. Did you see last week’s ‘restaurant wars’ episode of Top Chef All Stars? The cheftestants were challenged to create a pop-up restaurant and the guest judge was none other than Ludo Lefebvre. He’s the trendsetting chef behind LA’s famous Ludo Bites pop-up restaurants. Now, San Diego is getting it’s first-ever pop up with Relate opening for dinner Tuesdays through Saturdays February 3-26 at Bistro St. Germain’s in Encinitas. When the popular breakfast/lunch spot closes each afternoon, Chef Dan Moody will take the reins and the restaurant will undergo a complete transformation – with new art on the walls, different table settings and music to set the mood – becoming a fine dining experience for dinner service. Moody earned his pop-up stripes serving as sous chef for Lefebvre at Ludo Bites so he’s no stranger to the challenge. I caught up with the chef and asked him why he chose to launch this pop up in San Diego. Think you are ready to check it out for yourself? Moody is developing a menu for Relate that will weave contemporary French with down-home American cuisine in dishes like roasted baby beet salad with yam and Rainier cherry puree, shaved baby fennel, citrus, cinnamon and lavender; butter poached lobster, leeks, tarragon lobster oil, onion froth, beet chip and fennel jam; and spiced beef with spinach-avocado puree, crispy truffle spaetzle and Guinness gastrique. Diners who pop in can enjoy a prix fixe menu that changes from day to day and is priced around $50 per person. Wine and craft beer pairings will be available as well. Since Relate will only be open for 3 weeks, if you want to sample this culinary trend, you need to hustle and make reservations as they are sure to fill up quickly. To secure your seats at the table, visit www.relaterestaurant.com or call 858-367-3709.
Who doesn’t want to try the hottest new restaurant in town? There’s no better time to get out there and find your new favorites than during San Diego Restaurant Week. Because with reduced prices for three-course menus you can afford to explore a little. Barrio Star, Isabel Cruz’s newest spot in Banker’s Hill, serves up a fresh, creative take on traditional Mexican flavors. You’ll love the festive atmosphere and Day of the Dead-influenced decor almost as much as you’ll love the Restaurant Week menu items like chicken tamales made fresh, in-house daily and served with black beans, rice, and corn salsa; local whitefish with cumin and cardamom rub paired with cilantro-lime sauce, coconut rice and roasted tomatoes; and spicy chile relleno with jumbo shrimp. Priced at $20, this menu is a steal! 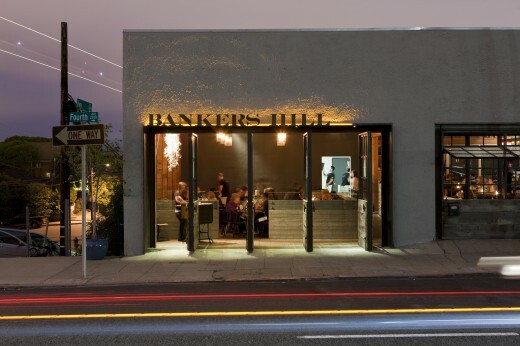 Banker’s HIll Bar & Restaurant, also located in Banker’s Hill (surprise, surprise! ), is the newest venture from the team behind Del Mar’s much-lauded Market Restaurant and Bar. Here, chef Carl Schroeder’s menu is still bursting with local flavors but focuses on hand-crafted comfort food and the vibe is neighborly but cool. From the $30 Restaurant Week menu you can sample items like proscuitto deviled eggs with parmesan-white cheddar crisps, bacon and arugula; coriander marinated rock fish ceviche with avocado, pico de gallo and BBQ spiced corn chips; or cast iron roasted King Salmon with artichokes, vegetable ragout, cauliflower gratin and lemon butter. Brand new in Ocean Beach, Bo Beau Kitchen + Bar is the latest addition to the mighty Cohn Restaurant Group. You’ll feel like you stepped right out of San Diego and into the South of France at this casual neighborhood bistro. Savor the experience with a $30 Restaurant week menu featuring options like boeuf bourguignon with baby carrots, pancetta, mushrooms, pearl onions and fingerling potatoes; leek ‘fondue’ macaroni and cheese in a silky cheddar gratinee; and Atlantic salmon with arugula-pesto gremolata and seasonal vegetables. What new restaurant are you excited to visit? San Diego Restaurant Week starts in just two days…make your reservations today! Indulge with San Diego Restaurant Week at the Steakhouse at Azul La Jolla. Located in downtown’s East Village, Cowboy Star mixes a modern-industrial vibe with a nod to Old Hollywood Westerns for a steakhouse experience like no other. The $40 Restaurant Week menu include choices like Snake River Farms Wagyu tartare with fresh horseradish, pumpernickel toast, arugula and créme fraîche or pan seared Wild Steelhead Salmon with black trumpet mushrooms, shaved Brussels sprouts, shallots and herb fondue. Plus exotic options like rabbit ravioli with sauteed wild mushrooms, Swiss chard, ver jus-rabbit emulsion and crispy pancetta. 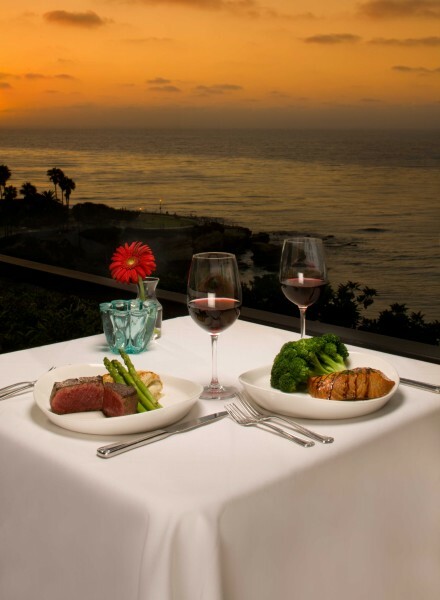 Perched overlooking La Jolla Cove, The Steakhouse at Azul La Jolla features a view of the ocean that will almost distract you from the open-kitchen action on the opposite side of the cozy dining room. But focus! Because that’s where the chefs turn out a $40 Restaurant Week menu with tempting options like rock shrimp pot pie with saffron vegetables; Berkshire pork loin with maple bacon, roasted kabocha squash and blackberry reduction; and New York Strip USDA prime steak with fried sweet shallots and red wine demi glace. Or, try your luck at The Grove Steakhouse at Viejas Casino. You can’t lose with a Restaurant Week menu that includes options like Green Lip mussels tossed in hot olive oil, Garlic and Lemon with a basil pesto broth; deep fried jumbo shrimp wrapped in applewood smoked center-cut bacon with a Monterrey pepper jack fondue; and tender 3oz filet medallions topped with a three mushroom ragu. Since it’s priced at only $30, you’ll even have money left over to hit the tables. Feeling like stepping out for a steak? What’s your favorite steakhouse? San Diego Restaurant Week is only 3 days away, make your reservations today! 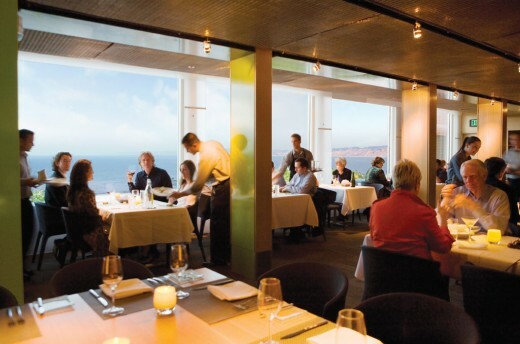 Ocean views and farm fresh food at Georges California Modern. With our reputation for bountiful beaches, it might surprise some to know that San Diego is an agricultural powerhouse that’s home to more than 6,000 farmers and #1 in the nation for small farms. Thankfully though, San Diego’s chefs are well aware of the region’s agricultural bounty and make it their priority to source ingredients locally and bring that homegrown San Diego goodness to you. Located in the heart of La Jolla, Whisknladle earned recognition from Conde Nast Traveler for their artisanal approach to farm to table cuisine. They make everything in house and source locally. Sample the results during Restaurant Week when you can order any three courses off their entire menu for the $40 Restaurant Week Menu price. Local items to look for include Crows Pass’ apples and persimmons served in a salad with balsamic vinegar-roasted onions, frisee and pistachio and Carlsbad Aqua Farms’ mussels paired with fries, shallots, garlic and bay laurel. With a killer location overlooking La Jolla Cove, George’s at the Cove could have just as easily been in my amazing views post. But, chef Trey Foshee’s passion for locally-grown produce makes his cuisine really stand out in the farm to table category. Downstairs in Georges California Modern he’s offering a $40 Restaurant Week Menu with options like local halibut with spicy pomegranate dressing, fennel and ginger gel or local yellowtail with a carrot-miso puree, bok choy and tangerine butter. Upstairs, on the open air Ocean Terrace, the $30 Restaurant Week Menu includes more casual options like butternut squash bruschetta with goat cheese and hazelnuts or penne with lamb, roasted tomatoes, black olives, artichokes and mint ricotta. JSix is helmed by Christian Graves who gardens for the restaurant on the rooftop of the downtown restaurant and adheres strictly to a ‘boat to pan’ philosophy that ensures the seafood he serves is delicious and ecologically sustainable. LIke Whisknladle, he’s celebrating Restaurant Week by making his full menu available for an incredible $30 Restaurant Week menu price. Go ahead and indulge in line-caught ahi tuna tartare with olive tapande and orange essence or the petite filet of beef with balsamic marinated portobello mushroom and feel good about it! What’s your favorite farm to table restaurant in San Diego? Make your reservations today…San Diego Restaurant Week is only 4 days away! 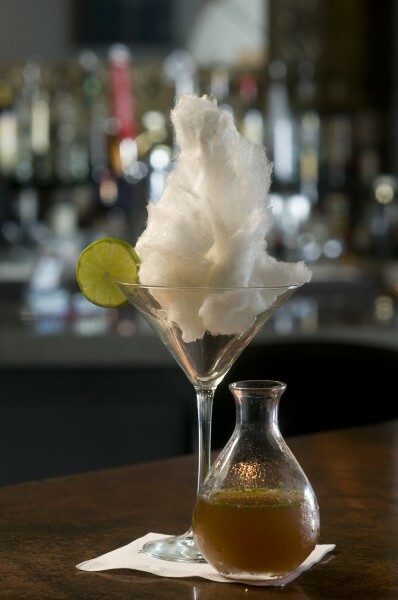 Try the Cotton Candy Cuban at Avenue 5. Heads up ladies. San Diego Restaurant Week is a fantastic excuse to gather up your best girlfriends, get all dressed up and have a girls’ night out. After all, when a little “me time” is on the agenda, nothing is more fun than dishing it up with your girls over an incredible meal and, more importantly, a rocking dessert. But, with so many Restaurant Week options, are you at a loss as to where to go? Avenue 5 Restaurant & Bar in Banker’s Hill serves up the most amazing cocktails. These aren’t any old Cosmos. Instead they incorporate molecular gastronomy techniques to make out of this world drinks that are sure to make your friends say ‘wow.’ Plus, their Restaurant Week menu is priced at $30 and includes options like wild mushroom risotto, anise-braised boneless beef short ribs and, for dessert, champagne sorbet, jasmine pot de crème or chocolate decadence with orange and berry compote. Feel like dancing? Put on your sexiest shoes and head to Stingaree where, after dinner, you and your girls are set to hit the club because this is also one downtown’s hottest nightlife venues. But before you kick up your heels, sit down to the $40 Restaurant Week menu featuring items like pink lady apple and arugula salad or jidori chicken breast with cous cous and dates. 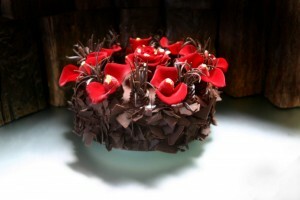 Then dig into desserts like red velvet cake with red hot ice cream or white chocolate crème caramel. Don’t worry, you’ll burn off all the calories on the dance floor! Located at the Hotel del Coronado, 1500 Ocean offers you and your girls the opportunity to channel Marilyn Monroe for a moment (she starred in Some Like It Hot shot on location at the Del) with a $40 Restaurant Week Menu that includes peppercorn tagliatelle with duck and pecorino or spice-crusted albacore with fennel-blood orange salad. For dessert, sample airy Tuscan donuts, the mysterious ‘Chocolate Indulgence’ or a sophisticated cheese plate with Rogue Blue Cheese, roasted grapes and honeycomb. Where will you be stepping out? And, more importantly, what are you wearing? There’s only 5 days left until San Diego Restaurant Week, make your reservations today! It's okay, go ahead and stare. Island Prime won't mind. No two ways about it, San Diego is gorgeous. With coastline for miles and natural beauty that just doesn’t quit, this town is good looking. 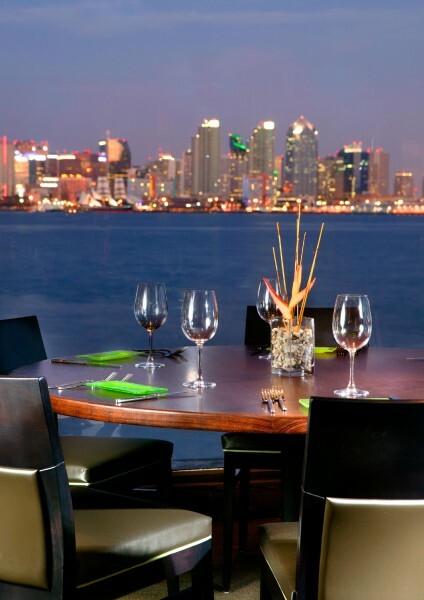 So, when San Diego Restaurant Week rolls around, you might as well opt for a restaurant where you can enjoy the view. Nestled on Harbor Island, Island Prime looks across San Diego Bay toward the downtown skyline with a view is pretty all day long and particularly spectacular at night. Feast your eyes on the view but don’t let it distract you from chef Deborah Scott’s amazing Restaurant Week menu items like butternut squash soup with toasted pepitas, cedar plank roasted salmon and filet mignon with sea salt mashed potatoes. The menu is priced at $40 and the million dollar views are free. Ride the elevator up to the 12th floor to Bertrand’s at Mister A’s for panoramic views of San Diego Bay, the downtown skyline and the lush green expanse of Balboa Park. This is where the city’s movers and shakers have gathered for decades and now , during restaurant week, you can enjoy the same upscale fare only at a fraction of the cost. The $40 Restaurant Week menu includes decadent options like Samanco Bay sea scallops, roasted leg of lamb Provencal and pan seared white seabass. Getting to Mistral at Loews Coronado Bay Resort takes just minutes but you’ll feel a million miles away when you look across San Diego Bay at the Coronado Bridge and the glittering downtown skyline. With floor to ceiling windows as the backdrop, enjoy a $40 Restaurant Week menu with options like yellow frisee and duck prosciutto salad, organic salmon with French green lentils, or Brant beef with creamy potatoes and haricot vert. What’s your favorite restaurant with a view? Only 6 days until San Diego Restaurant Week, make your reservations today!